Row 2 to 3 - 1ch, 1htr into base of 1ch, 1htr into each htr to end. Turn. Rpt Rows 2 to 4 working 3htr into centre htr on every increase row until 33tr remain and 19 rows have been worked from beginning. Fasten off. Edging - With WS facing join colour 1 to neck edge, make 1ch, 1dc into base of 1ch, work 20dc evenly into row ends along first side to corner, 3dc into corner, 1dc into each of next 15htr, 3dc into next htr, 1dc into each of next 15htr, 3dc into corner, work 21dc evenly into row ends up second side to corner. Turn. Next Row - 1ch, 1dc into base of 1ch, 1dc into each dc around bib to end, working 3dc into centre dc's of 3dc groups (corners). Fasten off. Next Row (Including ch ties) - Using colour 2, make 50ch, join yarn to neck edge with a dc, work 1dc into each dc down first side of bib, 3dc into corner, 1dc into each of next 39dc along bottom of bib, 3dc into corner, 1dc into each dc up second side, make 51ch. Turn. Next Row - ss into 2nd ch from hook, ss into each of next 49ch, continue down first side of bib working (1dc, 3tr) into next dc, * miss 2dc, (1dc, 3tr) into next dc, * rpt from * to * down first side, along the bottom and up the second side to last 3dc, miss 2dc, 1dc into last dc. Work a ss into each of the 49ch on first ch tie, 3dc into last ch, working on opposite side of ch, ss into each ch to neck edge, work 23dc evenly along neck edge to second ch tie, working along opposite side of ch's, ss into each ch to end. Fasten off. Flower - (Made in rounds without turning). Make a magic circle with colour 2, work 12dc into circle, pull loose thread to close circle, ss to first dc. Next Row - 1ch, (ss, 3ch, ss) into base of 1ch, * miss 1dc, (ss, 3ch, ss) into next dc, * rpt from * to * to last dc, miss last dc, ss to ss. Fasten off. 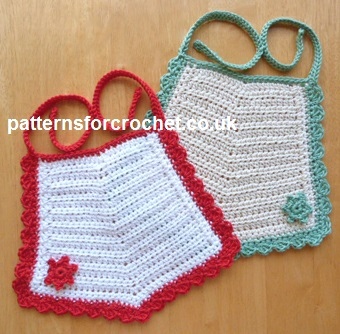 Hope you enjoy this free crochet pattern for pointed bib.